Quick release, dual density strap allows for an easy transition between cart and carry. 14-Way stadium divider top with 3 full length dividers. New for 2017, the Taylormade Flextech Crossover Stand Bag. 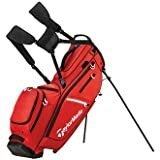 Designed for easy use the stand bag also features a quick release, dual-density strap to allowing the bag to go from cart to carry with speed, comfort, and stability. TaylorMade’s new FlexTech bag line features a patented smooth release system and collapsible base system to improve ease of use and prevent club crowding.